Even though it was only a month - Christmas seems so long ago. We are now settled back into our normal January routine, trying to adopt healthier lifestyle and longing for Spring! Hope you all had a Merry Christmas! Did everyone enjoy the festivities? I did but, my, doesn't it go by so fast? New Year already! I spent the week leading up to christmas cleaning, writing cards and wrapping - all the usual jobs. On Christmas Eve we had a small family get together. My parents, and my sister in law and my little one-year-old niece Emily who are over visiting from Germany. My brother is in the Falklands so couldn't come over with them, he was missed but it was lovely to spend some time with his little girl who I haven't seen since May. She has changed such a lot, walking, talking, dancing and laughing. Lovely to have a little one in the family again especially at Christmas time. I made Nigella's Ham in Coca Cola. I know it seems a bit weird to cook your gammon in coca cola but do try it, it's delicious. This will be my preferred method from now on. On Christmas Day we had our lunch in the pub with all the family - our homes are just not big enough to accommodate us all so we usually go out - plus it is a lovely treat and so nice not to have all the work involved with cooking a large christmas dinner. Although I do have my work cut out because we throw the family party at ours on Christmas Day evening - so instead of getting to vegetate on the sofa (I leave that until boxing day!) i have food to prepare followed by lots of booze and dancing! A great time was had by all! The rest of the week was spent visiting and in between, relaxing in pj's and watching TV. All the best for 2010 - how are we staying that anyway? twenty-ten or two thousand and ten?? A new decade -crikey that last one went by so fast. I had this post half typed on NYE, ready to post on the 1st but was struck down with the lurgy. It knocked me out and I've spent the last 4 days in pyjama land - and as lovely as it was, I am up and about today which is a good job seeing as I am back at work tomorrow. eek. I hope you have all had a good Christmas. I certainly have. Time well spent with family and friends. We've eaten too much, drank too much, laughed a lot, hugged, partied, felt all warm and cosy, played lots of games and quizzes, sung, danced, watched lots of TV, shopped and enjoyed each others company. We've spent a lot of time lounging around in our PJs or wrapped up outdoors in lots of layers, scarves and gloves. My dad celebrated his 60th Birthday - Happy Birthday Dad! We should have spent New Year's Eve at home with a small family get together. Mr Fuzz's family are Scottish so I made Stovies and Scotch Broth to eat. I couldn't face any more Christmas food or chocolate. Some of us (me) have eaten so much we should feel ashamed. However, seeing as my Vodka bottle was all dressed up it was invited to the partay. The party was a great flop! Everyone had the lurgy I had and went home early. When the house was empty me and Mr Fuzz both got on a sofa each to watch TV and fell to sleep only to wake up at 11:58! At least we didn't miss the bells. 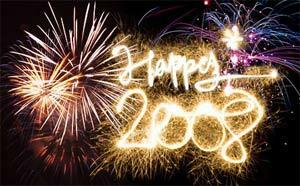 Best Wishes to all my bloggy friends for 2009 - may it be a year filled with peace, love and craftiness! When I picked out these gorgeous Elzybells stamps for my Christmas cards this year, I had no idea that I would have been visited over night by the real thing. It's been years since I've had a problem with mice because I have always had cats. Now we are a cat-less family once more, they have moved back in! We aren't having much luck catching them either. Last night they stole a chocolate Santa from the Christmas tree and ate its head off! I am freaking out a bit over this, cos I'm a bit of a fraidy pants...eek! and I can't stand the thought of a mouse party going on, while I'm tucked up in bed! I need a Wee Wonderfuls lovely tree mouse, not the real thing! To cheer myself up, I decided to make some more mince pies, but using this recipe. Wow - they are GOOD! I altered the recipe slighty and added a beaten egg so they would roll out easily. If you make these, whatever you do, don't try to remove them from the baking tin until they are completely cool. Otherwise they will fall apart. And you will have to eat all the broken ones before anyone notices. For some strange reason I've been awake since 4:55 am this morning and although I do love to be up early, I think my usual 6:10 is early enough. So seeing as I have some spare time until I go to work I decided to have a quick blog! There are some great offers and vouchers in the newspapers at the moment. Yesterday I got a voucher for 15% off at B&Q, there is 60% off trees and lights at Focus. Asda are sellling some mobile phones for £8 and have 17.5% off TVs and DVD players. I've spent the weekend at home so I made the most of it by starting the christmas clean, you know, the one before trimming up. I can remember helping my mum do it all those years ago! I sliced up a strawberry swiss roll and placed it in the trifle dish with some tinned strawberries. Then I drizzled some brandy over the swiss roll (ok - maybe my mother didn't do that but OMG it is so good with brandy!) I then poured a strawberry jelly over it. When it was set I topped it with custard and lightly whipped double cream. To decorate I sprinkled over some crunchy chocolate bits (Asda). So easy. So good. So 70's! We had a lovely quiet New Years Eve - phone calls from most of the family, nice food and a few drinks to see in the New Year. Earlier we saw St Trinians at the cinema - I loved it (and not just because it had my fav man, Colin Firth in) but J thought it was rubbish! Well you can't please everyone can you.